Bulbous irises, iridodictium, varieties, growing, landscape use, care, photo and video. Iridodictium – iris-Lily of the valley. The first flowers are the most welcome, messengers of spring is associated with the warmth of the sun, light, the imminent onset of the summer season. Irises are extremely popular among gardeners, original lush buds of all colors revealed on the suburban flower beds from the beginning of may. 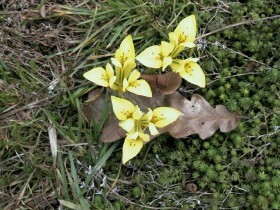 The number of species of this plant is enormous, more than eight hundred. It allows you to choose the desired colors and combinations to create songs of unearthly beauty. 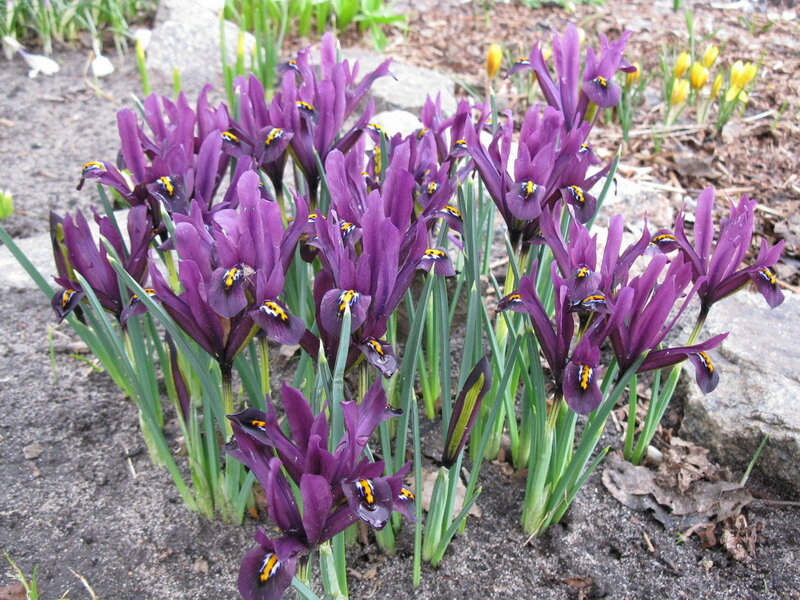 Traditional garden irises – rhizome, iridodictyum multiply ovate bulbs, they are called "iris-snowdrops". Height during flowering only 15 cm, then leaf growth continues, they reach a length of two feet. The flowers are bright and originally painted, the name of the plant said about it: diction – "mesh", iris – "rainbow". The color purple, blue and pale blue, white, blue, pink and red, purple, orange. Spots and stripes add a decorative. Some varieties exude a fragrance. Fruit – large box, when ripe crack. Iris bulbs among the stones. To avoid excessive dampness, flowers can be planted on artificial slope with a slope to the South side, to arrange a drainage. Enough to raise a bed at a 20 – 30 cm and to ensure a reliable outflow of rainwater. Irises love the sun, but some of the time ready to carry out in the shadows, flower garden the right thing to break on this site, where both are present during the day. Before planting, enrich the soil with organic fertilizers, dug, loosen. Manure is better to make in advance, a year before planting. The best soil for onion – lime. Alkaline reaction can be achieved, if you amend the soil the chalk, lime, egg shells. Sandy soil diluted with compost, add to it the ashes and superphosphate of calculation: 40 grams of fertilizer per square meter. In clay, on the contrary, add coarse sand, all the same humus and compost. Place, planted with iris, can not be changed for ten years. The ability of plants to rapid growth can lead to soil depletion and the need to change locations for flower beds. The features of this agro-technical works depend on the type of. In temperate latitudes are well acclimatized and tolerate the winter cold Turkey and the Caucasus iridodictyum, and their hybrids. In order to protect the purchased bulbs from fungi, they are treated with the respective compositions. On a dry and open place, you need to make a shallow hole to 7 cm. The bulbs are covered with soil, but not sealed, you can add sand. In the summer, when the leaves and stems will die off naturally, small daughter bulbs are separated and used for further propagation. 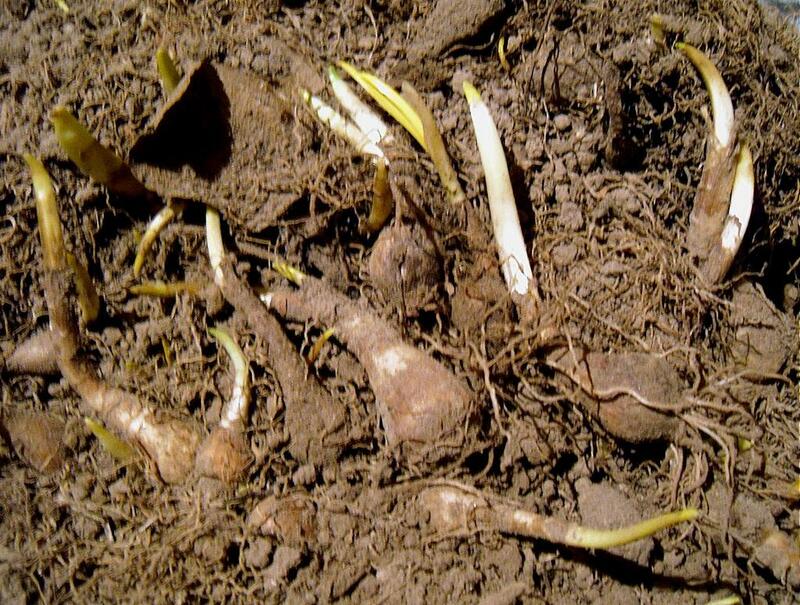 The bulbs of the variety "Juno" are different from other types of large size, the presence of fleshy roots, with whom should I be cautious, as a result of damage to the plant may die. The best period of the landing of bulbous irises – the last days of September or the first decade of the next month. Planting material is carefully lowered into the hole and sprinkle soil mix up to a thickness of 5 – 6 cm. Summer training of bulbs is, that dig them up after wilting plants and dry in a warm room with temperatures up to +25 degrees. Another option: cover the flowerbed with a film of rain until early October. Propagation of the variety produced by child or bulbs are planted in special boxes of seeds. Shoots appear in the second year after planting. The distance between plants when planting can be as minimal, in two widths bulbs, in this case, formed a Bush, and up to half a meter, if there is a need to make a single landing. In the second case, the plants will bloom more magnificently. Seeds are sown immediately after harvest to a depth 2 – 4 cm. Amicable shoots appear in early spring, but bloom are landing via 4 – 5 years. In this type of reproduction may not be preserved the signs of varieties. In stores you can buy a special basket for planting bulbs. It is made of plastic with holes. To plant irises in a basket, needed the future place of planting to remove part of the turf, to dig a hole to a depth of 30 cm, the basket should fit completely. 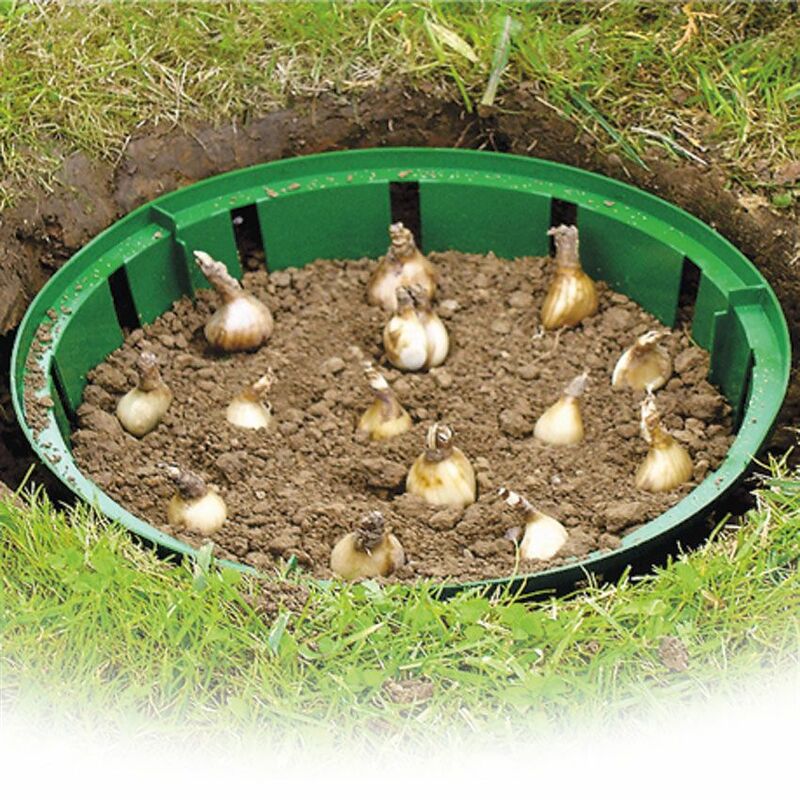 At the bottom of the pit poured fertilizer, put a basket of, fill with moistened soil and planted the bulbs. Planting material is covered with a thin layer of the earth, remote piece of turf back into place. Such planting will allow the plant to spend the winter in favorable conditions. If necessary, the basket can be easily removed from the land together with the bulbs and moves to dry in the room. 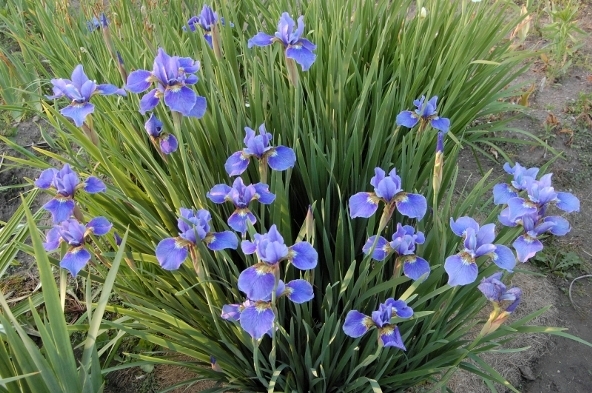 During the rainy season irises not watered, and in the dry season, the flowers moderately irrigate only in the evening. In the spring, waiting for the drying of the top soil, make fertilizer – ready solutions and dry mixes. You can just sprinkle the pellets on top of the soil and it is good to loosen the top layer, not to touch the roots. a month after the beginning of flowering – potassium and phosphorus (1:1). Regular and proper dressing provides rapid and long flowering, high decorative qualities. Fertilizing during the formation of flower buds ensure a good development of the plants next year. Excess nitrogen can cause adverse effect: deciduous cover will flourish, but iris won't bloom. Natasha – white with a bluish tint. 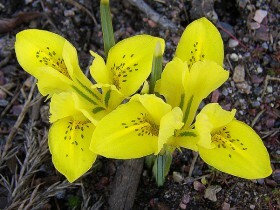 Irises Vinogradova – also of Caucasian appearance with large flowers of light yellow color, in nature rare. 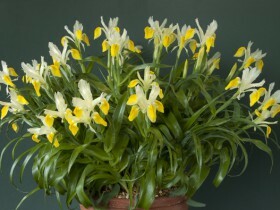 The most famous variety – "Katharine Hodkin", in the mixed color of yellow and pale blue. Iris Dunford – a native of Turkey,. Bright yellow and fragrant flowers with small greenish spots. 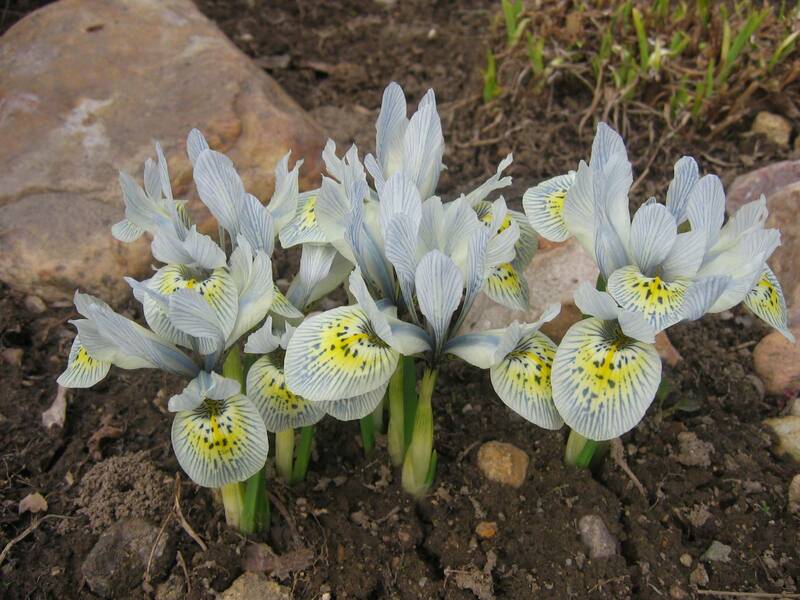 Iris Kolpakovsky it grows on rocky and forested slopes of the mountains of Central Asia. The flowers are pale purple with dark speckles. Iris Petrovicky – bulbous plant with blue flowers in white or Golden spots. Sun-loving bulbs, require humus-rich soil. 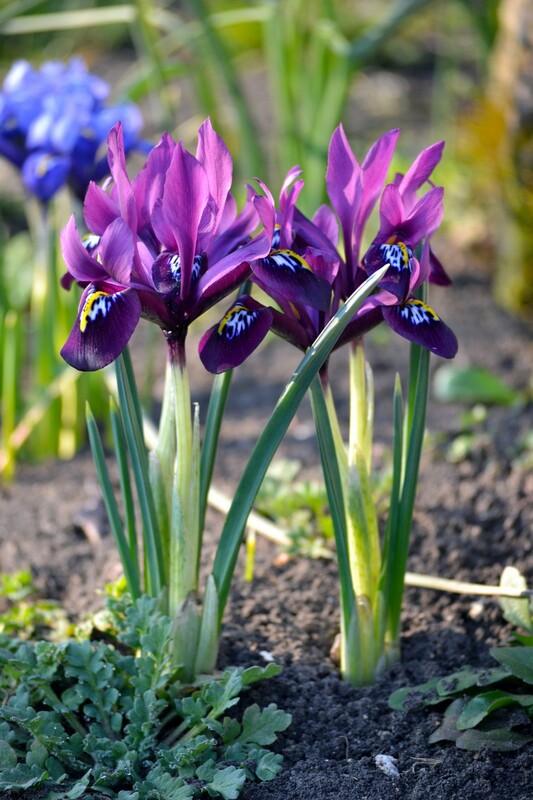 Planting should be done in September or October, depth of seal – 5 cm, the distance between irises from 15 to 25 cm. 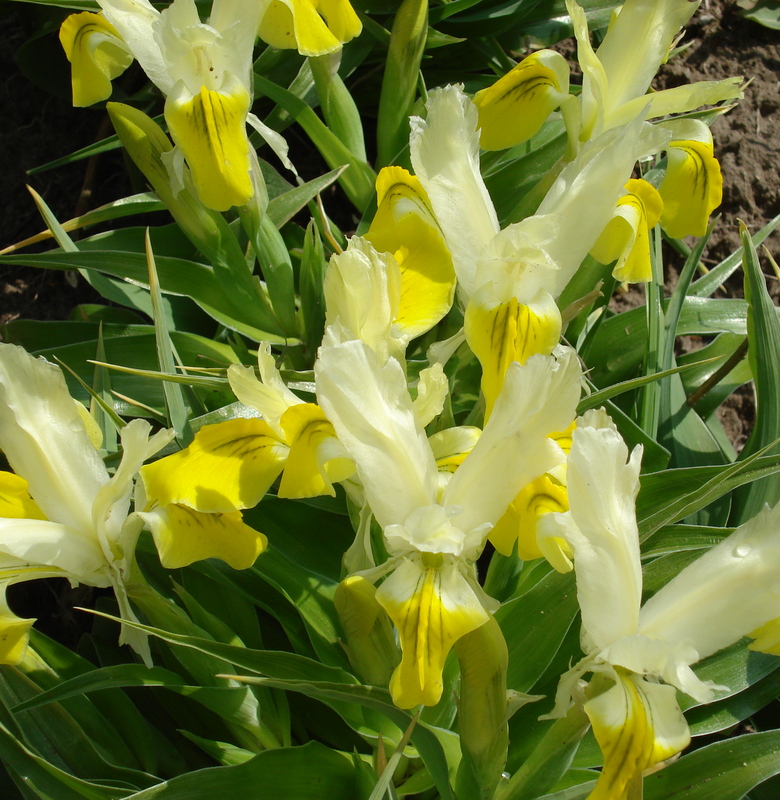 Bukhara iris grows up to a height of 30 cm, blooms creamy-yellow flowers, in April. 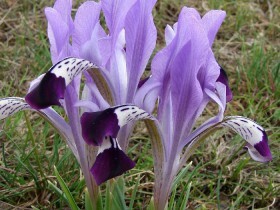 Iris magnificent, height – to 60 cm, flowers purple with white spots, blooms in may. 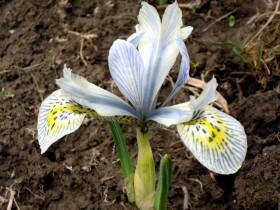 Iris grabulovski, height – to 30 cm, flowering is in April, flowers blue with white spots. Dwarf bearded look good in the landings on the Alpine hills neighborhood groundcover. Varieties of sun-loving and milovanovi, height – to 60 cm. Bloom in summer, good vase life. 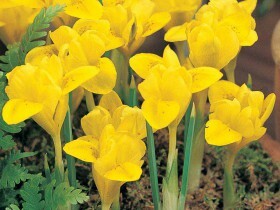 The bulbs are planted in autumn to a depth of 10 – 15 cm and the same distance from each other. Dutch bloom earlier than other varieties, in June and July and English irises, July – the time of the Spanish varieties. Iridodictyum suitable for planting on Alpine coaster. The plant goes well with other early spring flowering perennials. 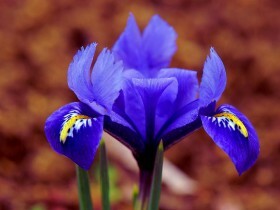 With iris you can create a bright blooming spot near places, where other plants feel uncomfortable. Recommended single planting in rocky gardens, in mixborders, beds, group beautiful clumps on the lawn. 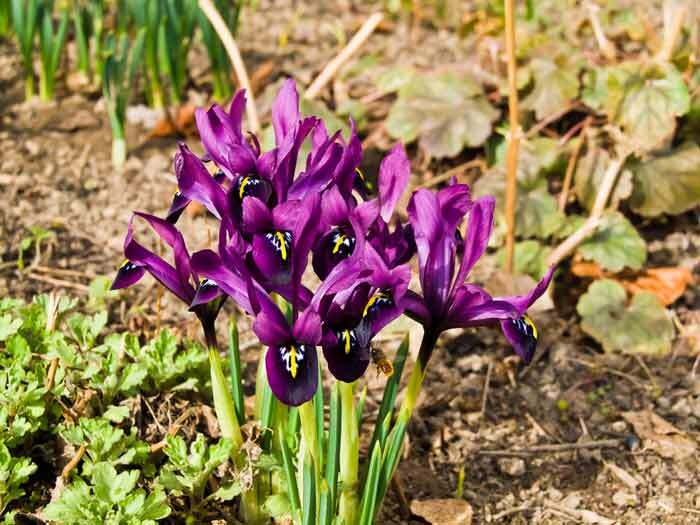 To prevent intruders it is necessary to conduct spraying irises every two weeks. To begin the procedure should be with the period, when the leaves reach the size 10 cm. There are universal pesticides. As soon as the buds – processing stop. Often plants sick bacteriosis, damaging the roots and bulbs, causing the decay of individual parts. 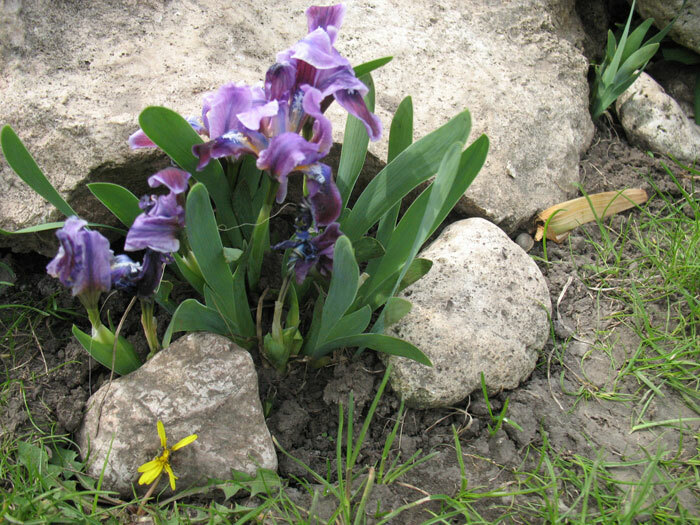 Iris you must dig up, remove damaged parts, rinse in a solution of potassium permanganate and transplanted to a new location. To notice the beginning of the disease is not so easy: reduced number of leaves in the beam, there are problems with the formation of flower buds. A good preventive measure is to remove the old stem together with leaves and stalks in preparing the bulbs for next year. In the dead parts of the plant can be insect pests. 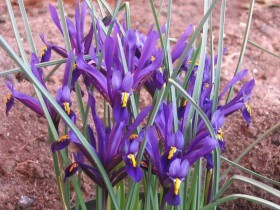 Right, traditional treatment for bulbous irises ensures vivid bloom, creating unique flower arrangements on the site. Iris Bukhara in the pot. All content on this site SamDizajner.ru written specifically for Simdesigner, copying 1 in 1 strictly prohibited. 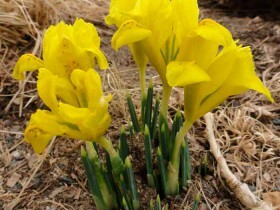 Reprint, full or partial rewriting of the article “Spring guests – bulbous irises”, possible, only when you specify the full, active link to the source.